Delta's exclusive DIAMOND Seal<sup></sup> Technology uses a valve with a tough diamond coating. InnoFlex<sup></sup> PEX waterways keep water inside the faucet out of contact with potential metal contaminants. This powerful combination brings you a faucet built to last up to five million uses. Only Delta faucets are equipped with Touch-Clean<sup></sup> soft, rubber nubbins that allow you to easily wipe away calcium and lime build-up with the touch of a finger. The included escutcheon completes the ensemble for a more finished look. Innovative technology meets great design in this Collins kitchen faucet. Its sleek design with the charm of simplicity complements any kitchen environment, making it a beautiful choice for your home. Delta's DIAMONDTM Seal Technology is the revolutionary water delivery system that combines a durable DIAMOND valve with InnoflexTM PEX waterways. The DIAMOND valve eliminates water's contact with potential metal contaminants once water is inside the faucet. This Essa Single-Handle Bar Faucet in Matte Black with MagnaTite Docking features a soft contemporary take on a euro design with subtle detailing accents that allow the faucet to blend with contemporary and transitional design. The pull-down spray wand comes free with a gentle tug and gives you total flexibility. The hose extends and retracts without friction points, fed by gravity. As you raise the wand to dock it, the magnet embedded in the spout pulls the wand precisely into place. So, unlike other pull-downs that tend to droop over time, MagnaTite. keeps your pull-down faucet looking picture-perfect. Delta's exclusive DIAMOND Seal. Technology uses a valve with a tough diamond coating. InnoFlex. PEX waterways keep water inside the faucet out of contact with potential metal contaminants. This powerful combination brings you a faucet built to last up to five million uses. This Delta faucet provides a practical, hardworking solution that will stand the test of time, every time. Delta is a reflection of your personality and is as individual as you are. A toggle on a Multi-Flow wand increases the stream from the standard 1.5GPM to a higher flow to more quickly fill the sink as well as pots, vases, or other large containers. Toggle back to 1.5 GPM for normal, everyday use. The innovative Multi-Flow feature can be found on a variety of Delta kitchen faucets. Delta's exclusive DIAMOND Seal<sup></sup> Technology uses a valve with a tough diamond coating. InnoFlex<sup></sup> PEX waterways keep water inside the faucet out of contact with potential metal contaminants. This powerful combination brings you a faucet built to last up to five million uses. Only Delta faucets are equipped with Touch-Clean<sup></sup> soft, rubber nubbins that allow you to easily wipe away calcium and lime build-up with the touch of a finger. The included escutcheon completes the ensemble for a more finished look. Beverage Faucet - Transitional, Chrome Delta's exclusive DIAMOND Seal<sup></sup> Technology uses a valve with a tough diamond coating. InnoFlex<sup></sup> PEX waterways keep water inside the faucet out of contact with potential metal contaminants. This powerful combination brings you a faucet built to last up to five million uses. Only Delta faucets are equipped with Touch-Clean<sup></sup> soft, rubber nubbins that allow you to easily wipe away calcium and lime build-up with the touch of a finger. The included escutcheon completes the ensemble for a more finished look. 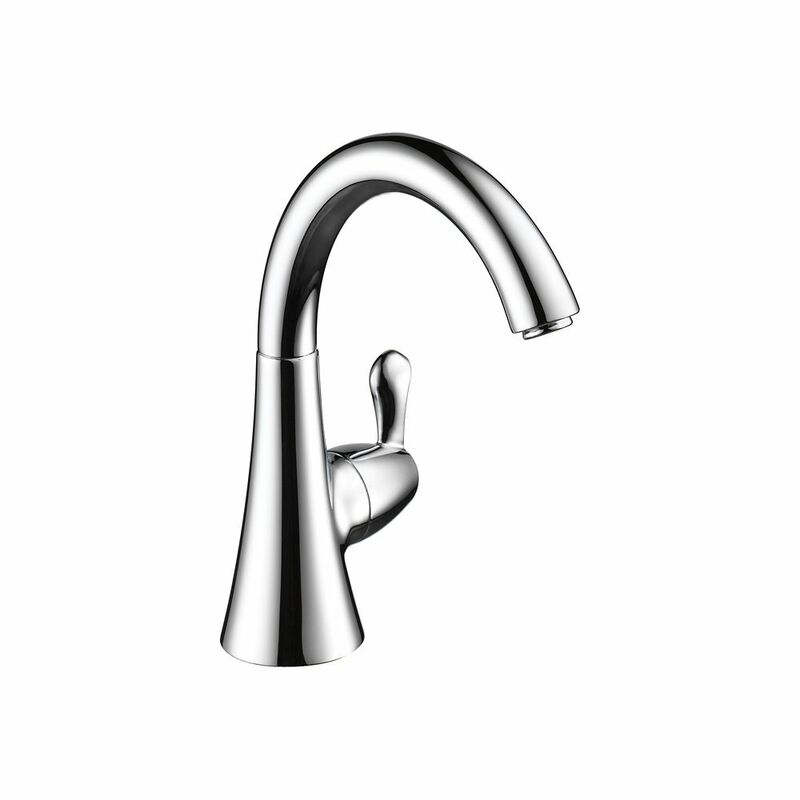 Beverage Faucet - Transitional, Chrome is rated 4.8 out of 5 by 25. Rated 4 out of 5 by Belle from Unfortunately delta doesn’t make any other beverage faucets that match their more modern, single-... Unfortunately delta doesn’t make any other beverage faucets that match their more modern, single-one-handle, kitchen sink faucet. Although it they still look good/decent together. Also, it is difficult to clean. You are only supposed to use water and a soft rag. However, I think you should be able to sterilize your kitchen sink area after preparing food. I find that strange- delta should put out a cleaning product that is safe for certain types of finishes. Rated 5 out of 5 by Pattie from Great! Had our kitchen remodeled and used this faucet for our under counter water filtration system. It works like a charm. Rated 5 out of 5 by Deborah from Easy to install. Product looks great and finish is easy... Easy to install. Product looks great and finish is easy to maintain. Highly recommended product! Rated 4 out of 5 by Hec from The faucet assembly and instructions were good. Would be nice... The faucet assembly and instructions were good. Would be nice to have all details available prior to purchasing the device since it did not fit the existing hole in the sink. Had to buy additional hardware for the installation of the faucet. Rated 5 out of 5 by Particular from This is a quality faucet that you can turn on and it stays on until you turn it off. Very pleased... This is a quality faucet that you can turn on and it stays on until you turn it off. Very pleased having it for my RO water filtration system. Rated 5 out of 5 by H2D2 from great, so far….... great, so far…. Rated 5 out of 5 by Jim1953 from Very nice looking faucet. Came with a male connection that... Very nice looking faucet. Came with a male connection that would not work with my reverse osmosis water system, so I had to cut that off. Used a 1/4" by 3/8" push connector and everything has worked great. It would have been nice to have those fittings as options "in the box".